A few months ago I shared an overview of the French children's magazines available in the U.S., and now I'm glad to give a more in-depth review of my children's favorite early childhood magazine: Popi. Popi (pronounced PUH-pee) refers to a cuddly stuffed monkey who was originally a character from an English children's book series by Helen Oxenbury. Now he has his own cartoon (Léo and Popi). But Popi magazine doesn't focus on the monkey much--he's just one of several reappearing characters with their own stories in each issue. Not sure if your toddler would even be interested in a magazine? I think you'll be surprised. The magazine is printed on thick paper that's easily manipulated but hard to tear, with cute edge tabs for each story. Besides the stories, each issue features two additional fold-out pages, a eye-spy scene, and a simple hands-on activity for amusement. After a few issues, my toddlers recognized the characters and enjoyed looking through the issues both on their own and with me. My favorite feature: Honestly, I find it hard to choose. I like the simplicity of the Petit Ours Brun story but consider Les aventures de Marcel equally endearing. And the imagier in each issue is helpful for learning and reviewing early childhood-oriented French vocabulary, such as sandbox tools. There's also an insert in each issue for parents with relevant articles and activities. My child's favorite feature: In some issues, Lili Souris is a paper punch-out character who can "play" and pass through holes in the scenes on her story pages. I laminate these paper characters with clear packing tape to keep them intact because they get played with so often. Why we stopped our subscription: The issues started to get a bit short for my older child when she was three years old, and I was curious to try another age-appropriate French magazine. (We switched to Toupie et Chansons). Nevertheless, at four years old, she still loves looking through her back issues of Popi, so I'm sure we could have continued enjoying the subscription for another year or two. How to subscribe: Contact the Bayard magazine sales representative in your region of the U.S.; he or she can send you a price list and subscription form. You can also subscribe through Bayam's English website, but it will cost more than going through a representative. 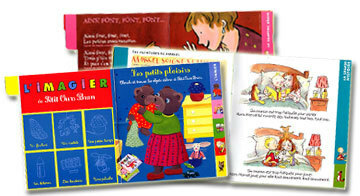 Bonne lecture avec vos enfants! Enjoy your reading together!